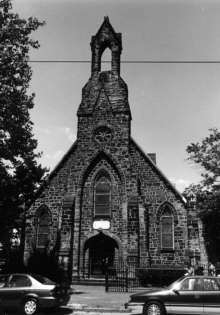 Trinity German Evangelical Lutheran Church was founded in Camden on December 22nd, 1858. The church building, which was dedicated on October 6th of 1861, is at 523 Stevens Street, and in recent years has housed the New Visions Community Center. The design of this Gothic building located on Stevens Street between Broadway and 5th in Camden, is in the tradition of St James the Less, built ten years earlier across the river in Philadelphia, but the original denomination was German Lutheran. The bright stone above the entrance proclaims, in German, this to be a German church, but the rest of the inscription is unreadable. An effort was made in 1853 to organize a Lutheran Church in Camden. A lot was purchased on Pine Street, west of Fourth, and the foundation laid for a church building. The minister was the Rev. Georgii, who soon afterward returned to Switzerland, before a congregation was organized or a building erected. In October, 1857, Rev. F. Herold arrived from Germany. On his way west he stopped with relatives in Camden, and on learning that a large number of Germans lived here, who desired to have a church and a pastor of their own faith in their midst, he concluded to stay. Services were held in Reed's Hall, on Federal Street. An organization was effected on December 22d of the same year. The congregation numbered seventy members. The following were the first church council: John Hager, John D. Seybold, Charles H. Fackler, John Beck, George Bauder, John M. Hertlein, Philip Dauer, George F. Stephany, Emanuel Schneider, J. Sommers and F. Schilpp. The congregation adopted a constitution and by­laws for its regulation. The principal points in it are: The pastor is obligated to preach in the German language, upon the foundations of the apostles and prophets ; the unaltered Augsburg Confession and Luther's Catechism, as the Confession of Faith of our holy Lutheran Church, to be the basis of all the teachings. The name adopted for the congregation was "Trinity German Evangelical Lutheran." The church council in June, 1858, purchased the lot on which the church stands. The funds available for building a church were very small, as the majority of the members were people of limited means. The pastor visited a number of the congregations of the German Evangelical Lutheran Ministerium of Pennsylvania, and solicited contributions. The members of the vestry also took their share of the responsibility and collected from friends and business firms wherever an opportunity offered, and in May, 1861, application was made to the Church Extension Society of the General Synod, and five hundred dollars secured. With this amount the work went on rapidly, and on October 6, 1861, the dedicatory services were held. In 1864 the school building at Sixth Street and Market was purchased, with its material, a building, twenty by forty feet, erected to the rear of the church, and the parochial school opened. In August 1865, Rev. F. Herold removed to Mascoutah IL, and the present pastor, Rev. J. C. Dizinger, accepted the call of the congregation. In 1870 the lots on the east and west sides of the church were purchased for fifteen hundred dollars. George Pfeiffer Sr. contributing one-third of the amount. In 1872 the church was repaired and beautified and the ground surrounding the church improved. In 1874 the school house received an addition of twenty feet in length and the latest improved desks were obtained. In 1883 a large pipe organ was secured. It was used for the first time on the four hundredth anniversary of Luther's birth. The congregation numbers at present (1886), three hundred communicant members. It has a Sunday school of three hundred members, a parochial school with two teachers and sixty pupils. A Funeral Aid Society was organized in 1876, which has now seven hundred members. The congregation is in connection with the Evangelical Lutheran Ministerium of Pennsylvania. .